It appears that a legal dispute lurking inside one of Capitol Hill’s most anticipated development projects has reached the surface. 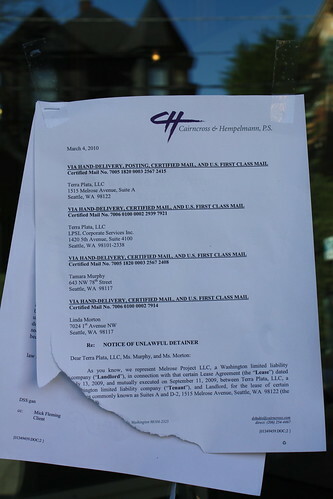 Thanks to a tip from neighbor Marcie, we found this letter from the law firm of Cairncross and Hempelmann taped to the door of what had been intended to be the new home for restaurant Terra Plata, the latest project from Seattle chef Tamara Murphy. 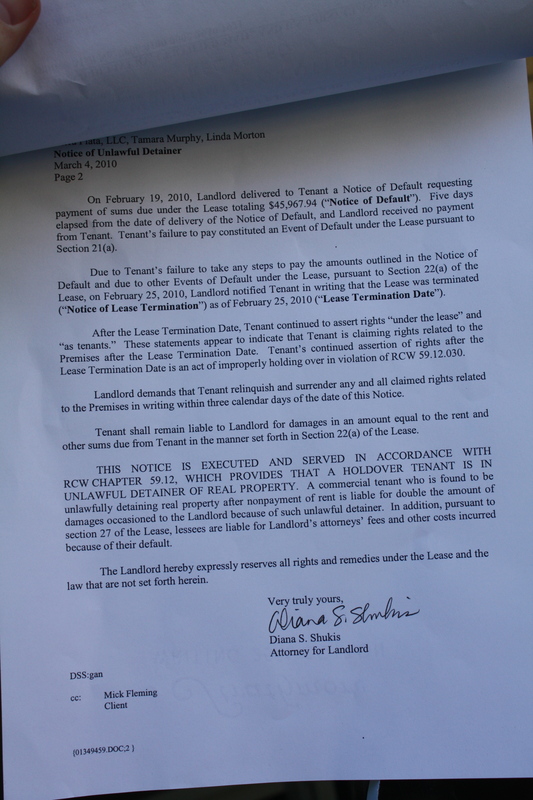 The letter describes some $45,967.94 in unpaid rent that lawyers say Murphy’s Terra Plata, LLC owes the Melrose Project, a corporation backed by Capitol Hill all-star developer Liz Dunn. It states that Terra Plata has lost the lease it signed back in September — indeed, large “for lease” signs now hang in the unfinished space’s windows. We have not been able to confirm with any party any details described in this letter. Confirmation below. We have messages out to Murphy, Dunn and the law firm and will update as soon as possible. The law firm’s letter documents the lack of rent payment and Murphy’s company’s continued assertion of “rights” to the property and goes on to demand that Murphy’s company relinquish these rights in writing by Sunday. And, of course, pay the more than 45 grand owed. Two people familiar with the situation have told CHS about tenant issues with delays on the ambitious Melrose Project. We have been told about missed dates and frustrations over lack of communication from the people running the project. Dunn’s projects are known for their reuse of historical building elements and a respect for the vernacular of the areas where she builds. While Sonic Boom, Velouria and STILL Liquor have recently moved in to the building, the spaces for other ventures including Murphy’s new restaurant are still works in progress. 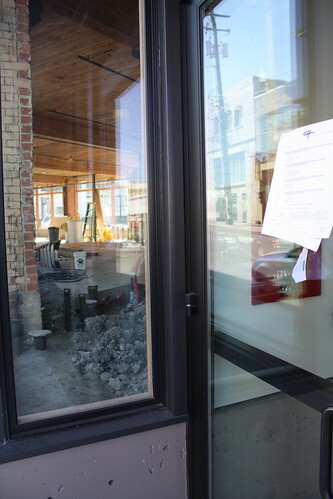 The view through the windows of the wedge-shaped space where the restaurant was to be built shows a mostly unfinished space with a partially finished concrete floor and exposed piping and wiring. Murphy, who is also working to ready Elliott Bay Book Company’s new cafe space by the time the book retailer opens in mid April, had stated that she hoped to open Terra Plata this month. Looks like the project wasn’t quite shaping up as planned. It’s a sad situation for both sides. We hope to have more of an opportunity to talk more with everybody involved. No word on if this will impact the other marquee restaurant lined up for the Melrose building. Sitka & Spruce pulled up its Eastlake roots to make the move to Capitol Hill. We’ve heard from one tenant that owner Matt Dillon is still in. On the S&S site, Dillon says he’s hoping for a spring opening on Melrose. There hasn’t been any work done on this section of the project in months. 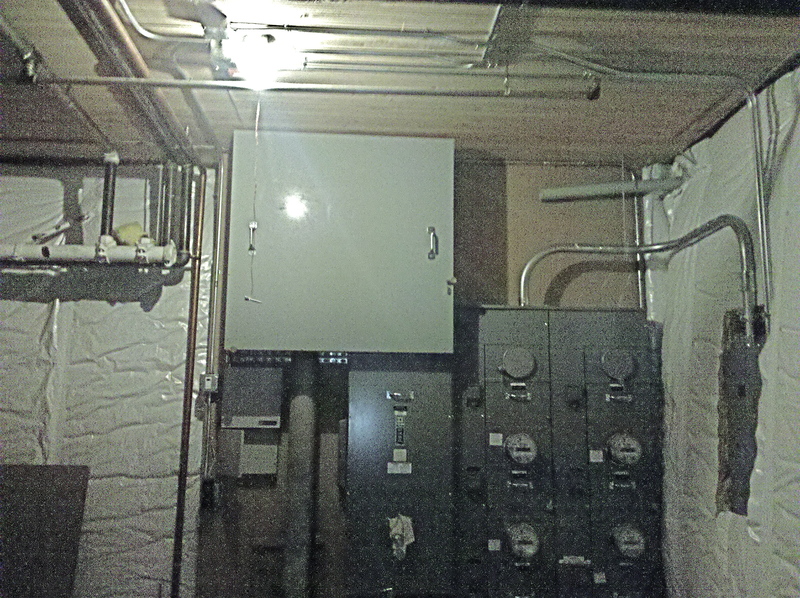 Especially considering how much work has been done in the other parts of the project. Kind of surprised there wasn’t any update earlier. This is truly sad news to hear, I was very much looking forward to working next door to Tamara and her project. However, these things happen. Good news is that development in the marketplace is going strong! The Calf & Kid, along with a few others, will be eagerly hosting a soft opening early/mid April. Wow. This is a huge disappointment. What a blow to the Melrose project and Capitol Hill! I really hope this deal isn’t dead in the water but if it is…feel sorry for any tenant coming in to replace Tamara! it’s fairly apparent that Scott Shapiro is the biggest baby out there. The best thing that could happen at this point is That everyone stops doing any business with these people. It shows that their juvenile and demeaning behavior of displaying personal information in public. They have displayed what kind of business people they are. it’s pretty simple DON’T DO BUSINESS WITH SHAPIRO . Of course there are always two sides. However, successful business relationships require listening on both sides. That is clearly not happening here. There is most likely another motive here – the oldest motive of all. MONEY. I would bet the landlords want it and need it so they will try to kick out Tamara and look for another tenant who will pay more. ( Starbucks) maybe they want Starbucks. So the story goes, when they say its not about the money…its about the money. Good for Tamara – she is standing up for what she believes is right. The landlords? Think about the word…….Land Lords!!!!! It’s no surprise to those of use familiar with any employee of Tamara’s other restaurant – Brasa – because none of them have been paid in months. She doesn’t take care of her employees – why open another restaurant (even though the food will be great) and abuse another set of them? Thank God this happened in time. Food – YOU ARE AN IDIOT!!!!! Get out of Seattle and go move to Oklahoma where you may find PLENTY of cheap crappy pedestrian food. We’re lucky to live in a city that has chefs like Tamara Murphy! Go grab a burrito roll at 7-11 and shut the hell up. I was paid – on time – every time. Don’t bite the hand that feeds you Mystery Man. Tamara is a wonderful woman and a talented chef. Try running your own (TWO) businesses in a recession.